On January 7, 2010, a beautiful thing took place in Louisville, Kentucky. Ninety-two aspiring young preachers gathered at St. Matthews Baptist Church to participate in the inaugural National Festival of Young Preachers. They came from east and west, north and south. They came from small towns and large cities. They came from high schools, colleges, universities and seminaries. They came from twenty denominations. They came with a passion for Jesus and a commitment to gospel preaching. 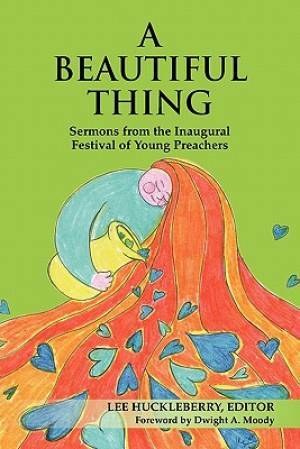 A Beautiful Thing features 59 sermons from this historic, ground-breaking event. In these pages you will be impressed with the talent, passion, intelligence, and authenticity of these fresh, emerging voices in American Christianity. Each sermon is a gift to the church in that is signifies the promise of a new day in preaching for the glory of God and the common good. A Beautiful Thing was published by Chalice Press in December 2010 and is our 56702nd best seller. The ISBN for A Beautiful Thing is 9780827202726. Be the first to review A Beautiful Thing! Got a question? No problem! Just click here to ask us about A Beautiful Thing.